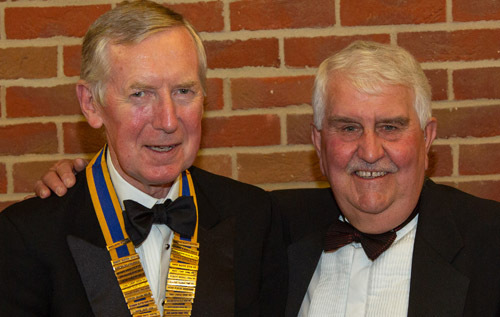 At the recent annual dinner of Reepham & District Rotary Club, outgoing president Trevor Nelson handed over the reins of office to Steve Griggs. Tony Williams becomes president elect and will take over in 2019. New Reepham & District Rotary Club president Steve Griggs (left) with outgoing president Trevor Nelson. Mr Griggs’ new charity for the year ahead – the 30th year of the club – will be Eating Matters, a Norfolk charity offering counselling to people with mild to moderate eating disorders in the community. The Rotary Club, which supports charities for three years, is also continuing to support the Benjamin Foundation and Norwich & Central Norfolk Mind. Last year, the club distributed £6,000 to its three main charities and raised £3,000 with other Rotary clubs for its African charity, Maliaka Kids. In addition, £1,500 was sent to the Aquabox relief charity and a further £1,000 has been distributed to local projects. Projects with local schools comprise a major part of the club’s community activity. It will again be supporting the Youth Speaks event, the Technology Tournament, the MasterChef competition and the Allotment Programme. Reepham Rotary members also take part in interview training, business and career advice, science ambassadors and primary school reading, while many have helped Reepham Primary School with its Japanese garden. In May the club held another successful Reepham Food Festival with the help of local businesses and organisations. The aim is for this to remain a fixture in the town’s calendar of events. At the end of August, Reepham Rotary will again be running the art exhibition at the Aylsham Agricultural Show on the August Bank Holiday (Monday 27 August). This attracts around 300 works from local artists and raises funds for the club’s charities. The club will also be providing the large Christmas tree in Reepham Market Place and helping with the management of the annual Festival of Light (this year on Thursday 6 December). And as the nights draw in, the club will hold its popular quiz night at Reepham High School. Members and guests also enjoy themselves at the Burns night supper, Christmas dinner and events such as bowling, gliding, walking and taking cars to the Continent. And next summer, after a year’s gap, the club will hold its annual golf tournament. On the international front, where Rotary clubs worldwide help with many humanitarian needs, the Aquabox keeps stocks of fresh water kits and emergency supplies for rapid distribution when there is a disaster anywhere in the world. Funds raised for the club’s overseas charity – Maliaka Kids – are used to support children rescued from the streets of Dar es Salaam in Tanzania, giving them appropriate education and skills, and helping them to begin to make a contribution to their society. The club’s funds are paying for the training of a nursery school teacher, a clothing designer, an electronic engineer and a medical officer. With 35 members encompassing a wide range of skills and experience, Reepham & District Rotary Club is involved in and supports projects in the local community and around the world.